Climate change protesters banned from campaigning at Heathrow Airport have taken their demonstration to the Airbus Superjumbo factory in north Wales. Six campaigners boarded a barge carrying a wing from the company's plant in Broughton, Flintshire. A spokesman for campaign group Plane Stupid said Broughton was targeted in reaction to an injunction against protesters near London's Heathrow. The Broughton plant produces wings for the A380, the world's largest passenger plane. Last week, Heathrow operator BAA won a High Court ruling banning certain protesters taking action. 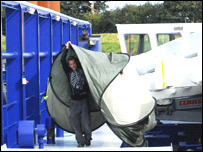 Leo Murray, one of those affected by the Heathrow injunction, said he and five others had "set up camp" on the barge on Monday morning, and had hoped to remain on the barge until ministers came up with a "safe" aviation policy. The protesters, who released their own video footage and still photographs of their actions, were later carried off by Airbus security staff. He said: "We'd have liked to have delayed the barge for longer, but I think we've successfully highlighted the fact that A380 planes are by no means environmentally friendly. "This is the end of today's protest, but you might find action being taken in other parts of the country this week." He added: "Climate change is a global planetary emergency and aviation is the fastest growing source of greenhouse gas emissions in Britain. "Extraordinary times call for an extraordinary response, and that's why we've set up a climate camp under the wing of an Airbus super-jumbo. "Plane Stupid believes the manufacture of thousands of new airliners to meet worldwide government-sponsored aviation expansion puts any chance we have of defeating climate change at grave risk. "Aeroplane manufacturers and airlines are at the forefront of lobbying for airport expansion across the globe. "While Airbus claims the A380 is more environmentally sound than previous models, the slight fuel efficiency gains made by technological developments will be more than wiped out by the huge increase in flights expected this century." Protesters gathered near Heathrow to highlight their concerns that the rapid growth in air travel was a major factor in greenhouse gas emissions. Graham Thompson, of Plane Stupid, said the Broughton protest was the result of a "certain amount" of planning. He added: "There is an injunction against taking action in and around Heathrow. "To a certain extent this is a reaction to that." Mr Thompson, who was not part of the Broughton demonstration, said the barge had not been damaged. It was carrying an A380 wing along the River Dee to the port of Mostyn. From there, the wings are shipped to Airbus's final assembly plant in Toulouse. Airbus said protesters had gained "unlawful entry," but the barge had not been delayed. In a statement, the company added: "While Airbus agrees with people's right to demonstrate, safety and security are our paramount concerns at all times and demonstrations must be lawful and demonstrators must behave responsibly." Near Heathrow, dozens of police officers have been inspecting a camp set up by protesters. 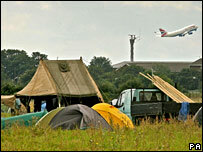 Up to 2,000 people are expected to pitch their tents for a week-long protest against plans to expand the airport.